Ships are awarded ribbons and medals just like sailors. 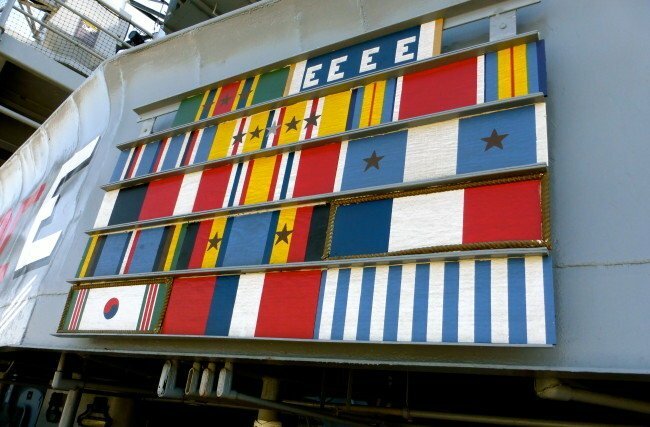 When a ship earns a ribbon, all the sailors serving aboard at the time are also awarded that ribbon. The ship’s ribbons are worn on the outside of her bridge wings. The USS IOWA earned 14 different ribbons over her nearly 50 years of service. The letters painted on the ship’s bridge wings are known as Command Excellence Awards. These awards show that a ship has proven to be superior in a certain area of operations. Hash marks below the letters denote multiple awards. Awarded for best ship handling, weapons employment, tactics, and command and control. The Battle “E” is awarded only once per year, and only one award per squadron. Possibly the most important Command Excellence Award a ship can earn, competition for this decoration is fierce, and not many ships can match the IOWA’s four awards.